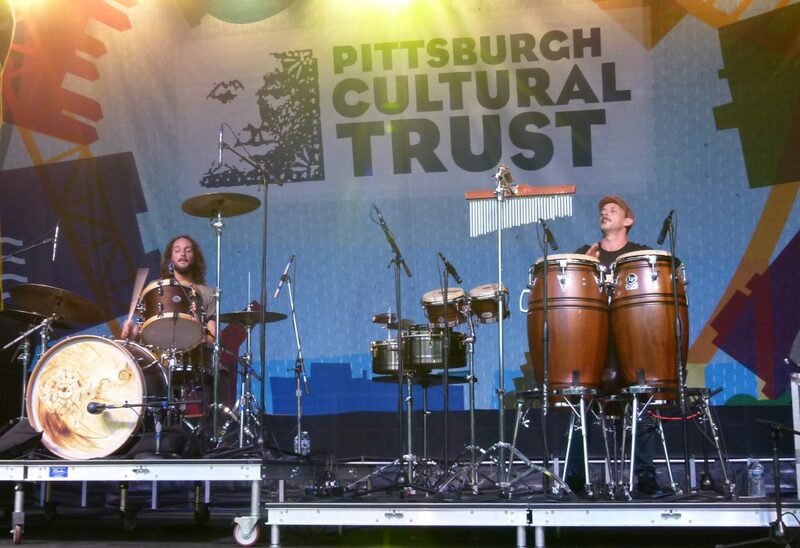 Lukas Nelson playing guitar while Anthony LoGerfo keeps the beat and Tato Melgar takes care of percussion. The Dollar Bank Three Rivers Arts Festival’s musical lineup always has several bands and performers that are very well known and others that are less known. Some of the lesser known ones are the biggest gems of the festival. On the schedule was Lukas Nelson & Promise of the Real. I had heard of them and probably had listened to some of their songs. My brain and gut were telling me to make sure to take a look at them. And I’m very glad that I did. I enjoyed their sound very much while watching some of their online videos. 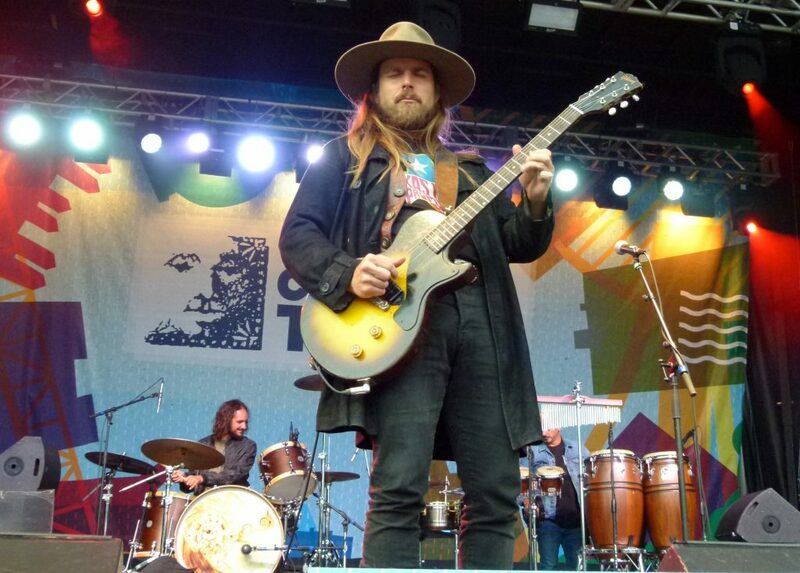 I also read he was the son of Willie Nelson and Willie Nelson’s current wife, Annie D’Angelo, and he’s played many a gig with his revered father. 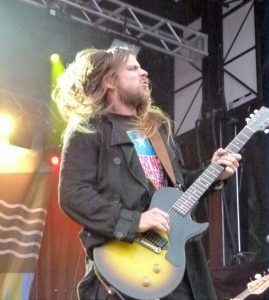 I also saw that Lukas Nelson had toured and collaborated with Neil Young and that Promise of the Real and Lukas’s brother, Micah, have been Young’s backing band for several years. All of these aspects piqued my interest. Fans are clearly enjoying Lukas Nelson & Promise of the Real’s music. 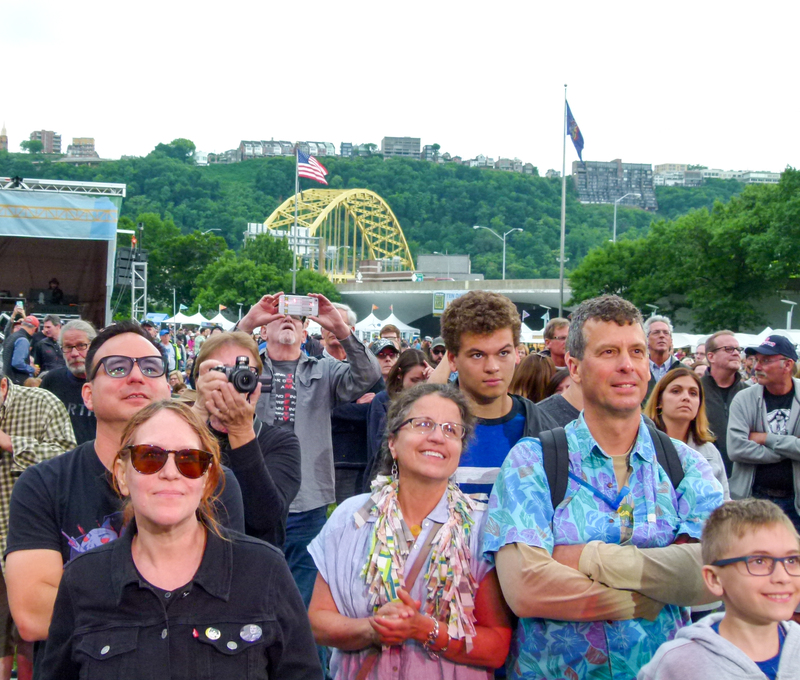 A large crowd, which was in the know regarding Lukas Nelson, was there for the free concert at Point State Park. It was a crowd composed of all different types of folks. Some town, some country. The weather was a little cool, but not cold. The perfect mix of gyros, hot sausage, and funnel cake aromas wafted on the breeze. Nelson and Promise of the Real took the stage at 7:30 p.m. Nelson greeted the crowd by saying “It’s a beautiful night to play music” and then launched into “Entirely Different Stars.” It started out as a slow southern blues rocker until Nelson turned up the heat with a frenetic lead guitar run three-quarters of the way through. The song speaks of living on a different planet with his girl, that the planet is pristine and not ruled by fear, greed, or war. Nelson’s vocals were very melodic with a hint of smokiness. “Die Alone” was up next and in a similar vein. 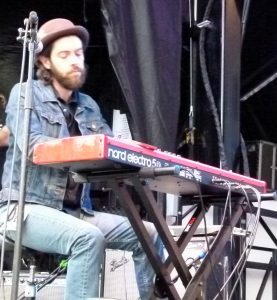 Jesse Siebenberg performing on the keyboards. “Fool Me Once” was a fun song with some top-notch slide guitar parts by keyboardist/multi-instrumentalist/backing vocalist Jesse Siebenberg. Nelson had some good performance interplay between himself and Siebenberg. They faced each other and jammed to one another for a while. He also had some fun with bass player Corey McCormick when they would face each other and jump up and down in unison while playing on several songs. He followed, “This one’s an oldie, but a goodie,” and began playing their song “Lil Girl” with the lyrics “Put a way back in your mind/There’s plenty love for you to find/Don’t let your dreams fall down the drain/I saw you crying in the rain.” Lukas’s vocals on the song had a hint of John Lennon in them. The song featured strong lead guitar with excellent drumming (Anthony LoGerfo) and percussion (Tato Melgar). LoGerfo and Melgar in action. Next Nelson sang “Georgia on My Mind,” the old standard written by Hoagy Carmichael and Stuart Gorrell and made famous by Ray Charles. Nelson shined while singing the high notes. He then said, “Here’s a brand new song for you,” and began the insightful “Turn Off the News.” The song saw Nelson on acoustic guitar, and he sang “Turn off the news and build a garden/Just my neighborhood and me/We might feel a bit less hardened/We might feel a bit more free.” He sounded a little like papa on this one too. Nelson jamming with bass player/vocalist Corey McCormick. He remarked that he dated a girl named Georgia once, and after they broke up, he was compelled to write the song “Forget about Georgia.” He was obviously trying to work her out of his system when he went into a killer guitar run near the song’s end, and the band jammed heavily with him. 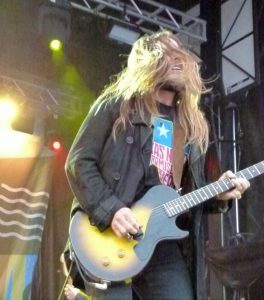 Nelson did “Find Yourself” with its slow, halting southern rock/blues beat, and he played some fiery lead guitar notes. He got the audience involved in a sing-along with the band and remarked, “I hear you Pittsburgh. Give it to me loud and clear.” During the song, he complimented them on how good they sounded. He proudly said that he worked with Stefani Germanotta (Lady Gaga) in crafting the song and spoke about their new project, the soundtrack for the remake of the film A Star Is Born. Nelson and Promise of the Real will appear in the movie as the backing band of Bradley Cooper, whom Gaga stars opposite of. It will be released this October. Nelson and Promise of the Real continued the jam with “Diamonds on the Soles of Her Shoes” by Paul Simon. Their version had more rock elements than Simon’s world-music influenced song while still remaining true to it. It almost sounded like a Rusted Root jam, including certain guitar riffs and beats with LoGerfo on drums and Melgar on congas and bongos. Ending the set was “Set Me Down on a Cloud” and “Start To Go.” The latter had a rollicking beat to start and some distinctive vocals by Nelson. He continued to show his lead guitar prowess on the song by playing the guitar with his teeth Jimi Hendrix style. The crowd was enthralled. Nelson thanked them, and he and the band took a bow and walked off. Two minutes later, after some loud encouragement from the crowd, they returned. Nelson said, “We got one more for you,” and promptly launched into the Neil Young classic “Cinnamon Girl.” Young would have been mighty proud of Nelson and Promise of the Real’s rendition. It was a fantastic ending to the night. 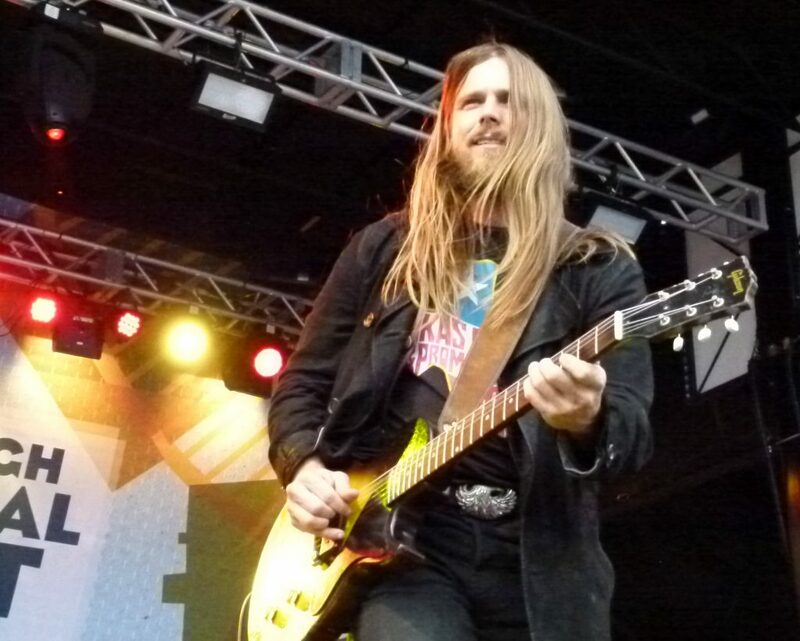 Lukas Nelson is an extremely talented musician and is equally skilled on guitars and vocals. His guitar of choice is a 1956 Les Paul Junior Sunburst. It gives his play a distinctive sound quality and is effective on both softer songs and scorchers. His songs can be both fun and serious, speaking about his own life experiences and offering hope in solving the world’s problems. He and the very skilled Promise of the Real are on the rise, and I look forward to more quality music from them in the future. 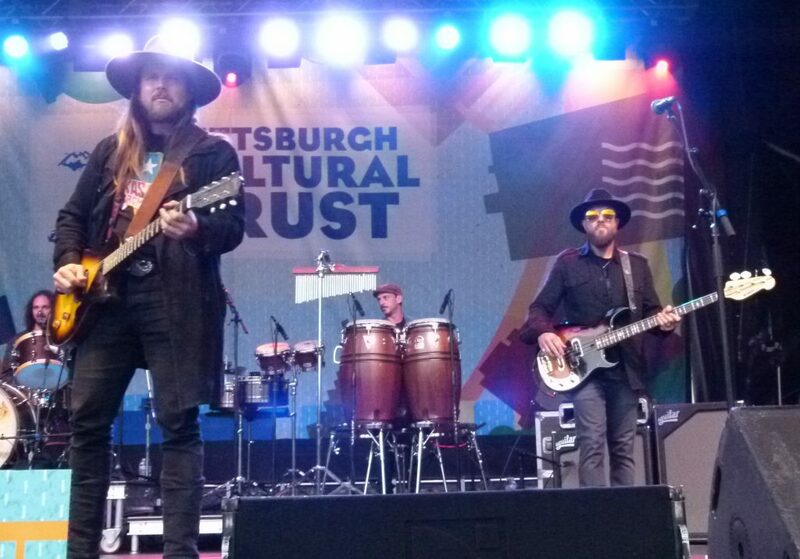 We will have another opportunity to see Lukas Nelson & Promise of the Real this year when they return in September to play the star-studded Outlaw Music Festival at KeyBank Pavilion. His dad, Willie; Van Morrison; and other acts are also on the bill. Photos and story by Rick Handler, executive producer of Entertainment Central.